Today, October 19th, is the feast of the Canadian Martyrs. 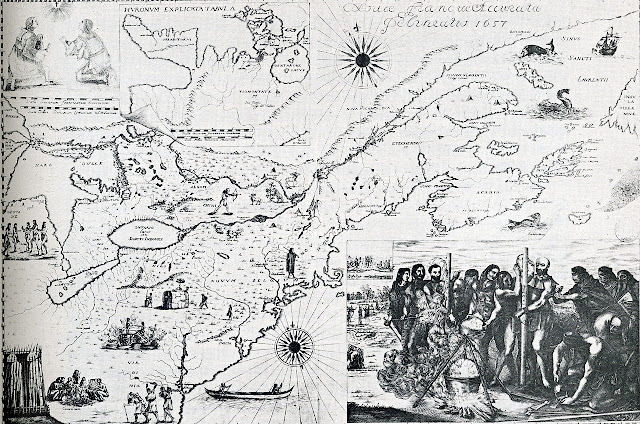 In the mid 17th century a handful of French Jesuit Missionaries – Rene Goupil, Isaac Jogues, Jean de Lalande, Anthony Daniel, Jean de Brebeuf, Noel Chabenal, Charles Garnier and Gabriel Lalemant - made the harrowing journey from France to New France (Canada) in order to minister to the Huron Wendat peoples of Central Ontario and Upstate New York. While there were some converts to Christianity, the lives of these Jesuits were fraught with difficulties here in Canada. Rene Goupil was a deaf surgeon who had volunteered to serve the Jesuit Fathers as a lay missionary in 1639, leaving for New France in 1640. His work was primarily with the sick and wounded at a Mission site near Quebec. While travelling to the Huron mission, Sainte Marie, in 1642 Rene was captured by the Mohawk Iroquois along with 40 other Huron and Jesuits, brought to present-day Auriesville, New York and tortured and martyred. Goupil is said to be the first of the 8 Canadian Martyrs. Isaac Jogues joined the Society of Jesus in 1624, being inspired with missionary zeal throughout his studies. Given a dispensation to cut his studies short, Jogues was ordained a priest in 1636 and set sail for New France, arriving in the village of Quebec in late May. He was captured by the Mohawk Iroquois in 1642 and tortured, but miraculously lived and served the Mohawk (as a slave) for several years, eventually making his way back to France at one point. Jogues was again captured several months after his return to New France in 1646, and died on October 18th from a tomahawk to the head. Jean de Lalande was a 19-year-old lay brother sent to New France to serve the Jesuit Fathers. While accompanying Isaac Jogues to the Mohawk Mission, Lalande was one of the group of 40 Huron and Missionaries that were captured by the Mohawk Iroquois and taken to present-day Auriesville, New York. He was tortured and martyred on October 19th, 1646. Anthony Daniel joined the Jesuits in 1621, and in 1632, two years after his ordination, sailed to New France. In 1633 Daniel joined Champlain in his travels to Quebec, and ministered to the people there for several years, translating prayers into the Wendat Huron language, and teaching young boys. While at one of the Huronia Missions, the Iroquois launched a surprise attack in 1648 while the Huron men were away trading. Fr. Daniel, after giving the women, children and elderly general absolution and quickly baptizing the catechumens with his handkerchief dipped in holy water, he took up a cross and walked straight out into the middle of the advancing Iroquois. Temporarily stunned, the attackers stopped for a moment, before firing on Anthony Daniel and raiding the fort, throwing his body into the burning church. But Fr. Daniel’s quick thinking allowed for most of the Huron to escape and he was later lauded by a fellow priest as a “truly remarkable man, humble, obedient, united with God, of never failing patience and indomitable courage in adversity”. Jean de Brebeuf had been in the Society of Jesus for 8 years before he was sent to New France with Charles Lalemant. Having an aptitude for languages, Fr. Brebeuf quickly became proficient in the Huron language and worked to translate Catholic prayers and catechism into the native language. The summer of 1629 brought Champlain’s surrender to two Scottish merchant brothers, and Brebeuf was sent back to France for a few years, only to return to New France in 1633 to continue work in teaching and translating, working towards the singular task of converting the Huron peoples to Christ. Jean de Brebeuf was captured, tortured and finally martyred on March 16th, 1649, when the Iroquois destroyed the Huron mission village of Sainte-Louis. Noel Chabanel entered the Jesuits at 17 years old and was highly esteemed for virtue and learning. He was sent to New France in 1633 but had a hard time learning the Algonquin language, felt useless in ministry and had a strong repugnance for the native way of life. Despite these things and the constant threat of martyrdom, Chabanel vowed to stay with the Huron until his death, which occurred on December 8, 1649, by what has been described as a “renegade” Huron. Charles Garnier was ordained a priest for the Society of Jesus in 1635. Initially being forbidden to travel to New France by his Father, Garnier eventually made the trip in 1636 where he spent the rest of his life ministering to the Huron peoples. He was considered the “lamb” (opposing Brebeuf’s “lion”) and was greatly influenced by his fellow Jesuit. Garnier was killed, by the Iroquois on December 7, 1649. Gabriel Lalemant was one of six children, five of whom entered religious life. Two years after joining the Jesuits, he vowed to devote himself to the foreign missions and eventually arrived in Quebec in 1646. Little is known about him except that he was of a frail constitution. He ended up replacing Noel Chabanel at the mission of Sainte Louis, and was captured in the same skirmish with the Iroquois that saw the death of Anthony Daniel. He was taken, with Jean de Brebeuf, to the nearby mission of Sainte Ignace and tortured and martyred on March 17th, 1649. We can learn so much from the examples set by these Martyrs – perseverance, charity, courage, and patience amongst many other virtues. And each one of them has something a little bit different to offer us. I myself was heartened to read that Noel Chabanel experienced uselessness in his ministry (what mom doesn't feel unneeded or useless once in her life), yet still vowed to stay with it, and that Gabriel Lalemant suffered with ill health but was devoted to the foreign missions. Sometimes the stories of the saints come to us so sanitized, almost artificial, biographers sometimes omitting that which would make the person seem real and, in one sense, human. But there was nothing sanitized about the lives of these 8 men. The lives they lived in New France were brutal from start to finish. But it becomes obvious when reading their stories that each missionary was inflamed with that zeal, that unquenchable flame of love for Christ that burns hotly for souls. It was written that Jean de Brebeuf converted a mere 14 people after 10 years of ministering to the Huron people, but the man never gave up. He continue to work tirelessly, even in the middle of torture, concerned for the souls of the Native converts. Oh that we could experience even a drop of that kind of zeal for Christ. These 8 martyrs were canonized on June 29th, 1930 by Pope Pius XI. Their feast day is celebrated on September 26th in Canada and October 19th in the USA and they are (secondary) patron saints of Canada.